This was my first Smurf cake! My friend asked me to make it for her daughter. I made the Smurfs from chocolate. The roof was made from a bowl cake that I carved to look more “mushroom-like”. Of course, my kids were there to eat up the scraps and “cake-tops” as they call them, lol. Then, I carved the bottom cake to form the base of the shroom. I covered them both in fondant. The chimney is fondant with a straw going through it for added stability. The base cake is a 10″ round, single layer. Next time I would probably make it a double layer cake so I could add more “landscaping”. 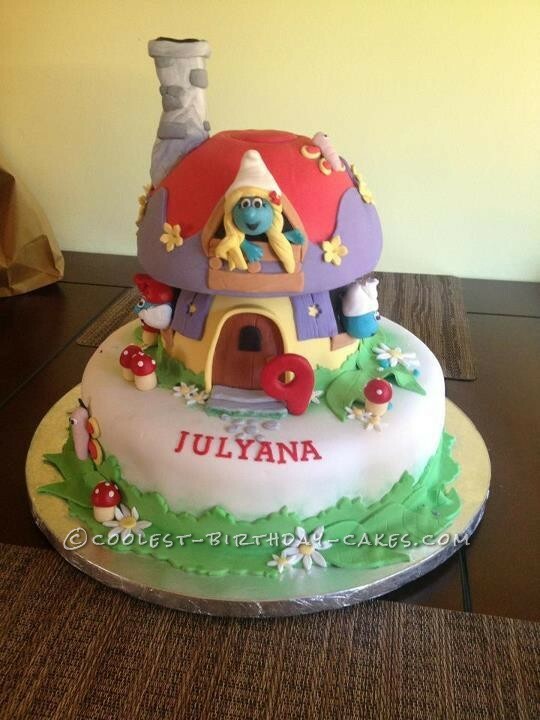 I would also make the bottom the mushroom a little higher so the smurfs fit in the windows better. I had to remake Papa because he was too big. Over all, pretty happy with the end result and my friend loved it so that’s all that counts.